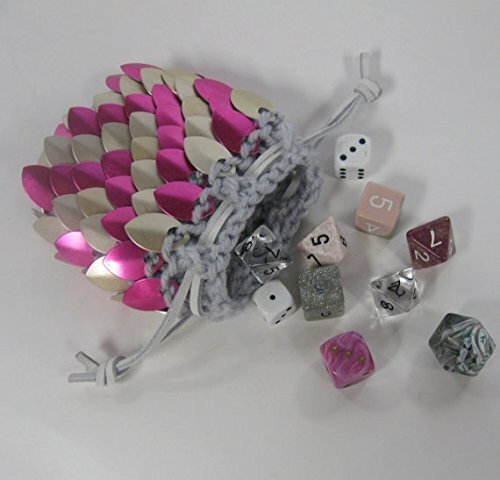 As bright and cheery as ribbon candy, this scalemail dice bag has a pattern of alternating bright pink and silvery beige anodized aluminum scale arrows. The scales are knitted into pale grey acrylic yarn. Use it to hold your dice or any other small treasures. The double white leather drawstrings allow for fast secure closure. The design is stretchy should you make a good haul and need a little more room. The dice in the picture are NOT included. This bag will hold a single handful of dice. It measures 3.5" wide x 3.5" tall. More colors and sizes can be found here: http://amzn.to/2aTmG2S Dragonhide is hand washable in warm water and mild detergent, lay flat to dry. The scales are used are permanently colored, the color can be scratched off, but just washing doesn't affect them. Remove leather laces before washing.